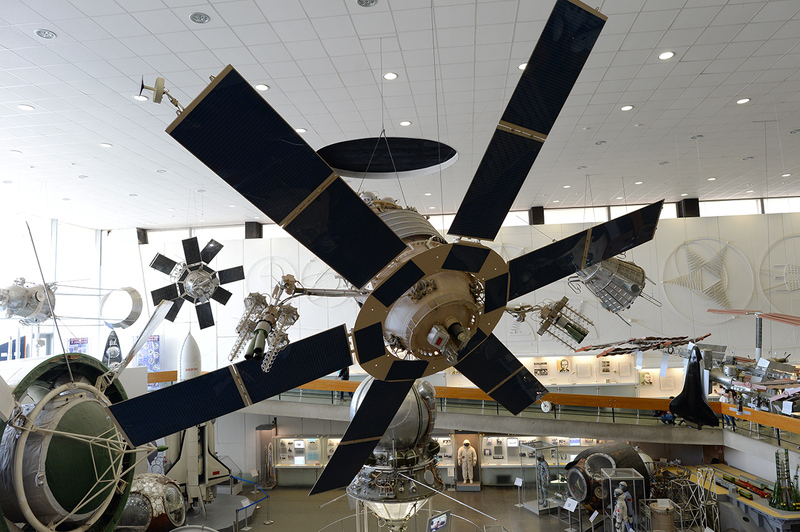 Exhibits in the hall of space technology inside the Tsiolkovsky State Museum of the History of Cosmonautics in Kaluga. Konstantin Tsiolkovsky (1857-1935) never finished high school, but he had dreams of flights to space. In his little wooden house in the outskirts of Kaluga he created his own models and tin structures. Today, engineers throughout the world still use Tsiolkovsky's ideas and calculations. In 1885, when only rubber aerial balloons ascended to the sky, 28-year-old Tsiolkovsky elaborated the theory of how to create the first metal-clad airship, which was better than existing dirigibles not only with its technical characteristics but also with the fact that it used hot air as fuel, not hydrogen. Tsiolkovsky, however, was not given the necessary economic support to build the airship. Almost 50 years later, however, calculations made in a Soviet factory proved that Tsiolkovsky's concept was correct. Another of Tsiolkovsky’s ideas that was not well-received by his scientific contemporaries anticipated the appearance of planes in the form that we know them today. The airplane, according to Tsiolkovsky, had to have the form of a "soaring bird frozen in flight." He pointed to defects in existing models that imitated the flap of wings, and proposed creating planes out of metallic constructions with a streamlined form that would help increase speed. His construction ideas were more progressive than the later projects developed by the Wright brothers, Santos-Dumont, Voisin and other aviation pioneers. In the final years of the 19th century Tsiolkovsky was developing a theory of using jet engines. He was the first to prove that a rocket is the only vehicle capable of flying to outer space. In his sketches it looks like an oblong metallic construction. In this and subsequent publications, Tsiolkovsky proposed projects for a jet engine, a steering wheel for controlling the flight and many other ideas that today are used for building rocket carriers. Tsiolkovsky designed not only the engineering aspects of launching objects into space but also introduced a formula that determined the speed a rocket needs to exceed in order to overcome Earth's gravity and go into orbit. Several years later, he calculated the optimal flight trajectory for the descent of a body toward Earth. Today, this trajectory is used for landing a space ship, which means that Tsiolkovsky knew how to bring back to Earth something that did not yet exist. In the 1920s, Tsiolkovsky thought of how to use a multistage rocket system, the "rocket trains," as he called them. This served as the basis for the creation of the first spaceship. In 1935, in his treatise, "The Rocket's Highest Speed," he affirmed that with the level of technology at the time it would be possible for a rocket to escape Earth’s gravity only with the help of a multistage rocket. This is still valid today: all modern rocket ships have carriers that are multistage, and this is the system that Vostok-1 had when on April 12, 1961 it was the first to take a man to outer space.